Hello Ryan, thanks for your report. The page loads fine for me, however. Does the browser always crash on this page for you, or did it just happen once? The Huffington Post site is hard work for any browser, but if we can't reproduce the crash, it will be hard or impossible to fix. I can't replicate it either, though the nature of the crash suggests this is in cross-platform code, so this is probably an underlying Mozilla bug. That said, this is sort of a "receive and file" -- if you can give us reliable steps to trigger it, we can see if we can reproduce it. One polite request: thanks for the crash report (it's exactly what I need), but if you can just put it in a file and attach it, that will be a bit easier on the eyes and the screen. crash on opening add-ons had 5 tabs open with the web address's tab 1 (http://lowendmac.com/modbook/modbook.html), tab 2 (www.huffingtonpost.com/gay-voices/), tab 3 (http://www.imdb.com/title/tt2489576/), tab 4 (http://tenfourfox.tenderapp.com/discussions/problems/60-html5-video...), and tab 5 (https://eshop.macsales.com/celebrate/25th/sweepstakes). 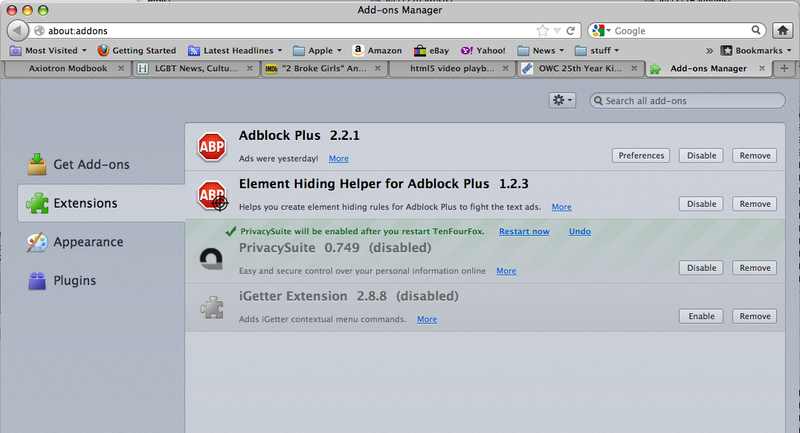 Was opening add-on to figure out why PrivacySuite 0.749 wasn't showing up also have adblock plus 2.2.1 and element hiding helper for adblock plus 1.2.3 enabled also have but disabled iGetter extension 2.8.8 when in add-ons saw that PrivacySuite 0.749 was disabled before crash reopen tenfourfox and it didn't crash again clicked restart now and it wasn't enabled even after trying twice with same tabs open third time crashed again. Again, because these are intermittent crashes you're reporting, there isn't a whole lot we can do with them (I can't cause my systems to crash with your steps). If you find a way to reliably set it off each time, that would be more helpful.